Will Facebook help you choose your groceries? I've been preaching the Transparency Gospel for over three years - suggesting that as technology allows more people to find out how good a product really is (from objective experts or digitally aggregated peers) it will become more and more important to actually have great products. The theory is a no-brainer in considered purchase categories. But even I wondered if this behavior would ever trickle-down to the grocery store shelf. Will people actually take the time to compare the ingredients or the carbon footprint* of two different brands of baked beans? Apparently people will take the time and are interested in these rational issues when it comes to food purchases. As reported by Marketing Charts, Deloitte's new "2010 Consumer Food Safety Survey"spells it all out. As you might expect, most of the study relates to food safety but a few of the findings have broader marketing implications. First, people are going online to do their homework prior to shopping shopping for food items: Twenty three percent of consumers visited a food company's website to get product information while 23% of consumers made a food purchase as a result of something they read online. More interesting was the impact of smartphone technology. 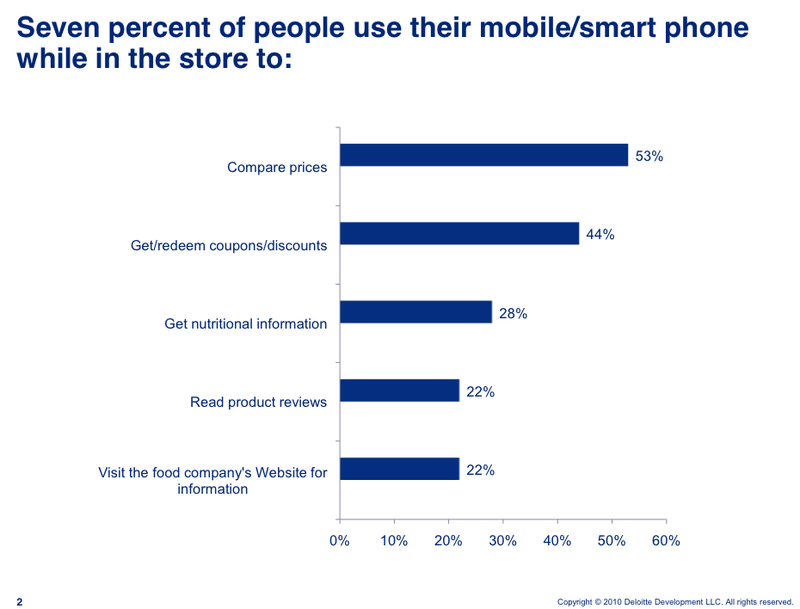 As the chart below illustrates, 7% of people have used their phone in-store to learn about potential purchases (click chart to enlarge). These data demonstrate people have an appetite for detailed and objective information regarding their food purchases. Technology is filling a need that apparently is not being met on the package. Where is this going? According to comScore, approximately 17% of the U.S. (age 13+) had a smartphone in December of 2009. That means over 40% of those with the ability to use a smartphone while shopping for food did so. Multiple sources predict smartphone penetration to increase to 40 or 50% in the next 24 months. 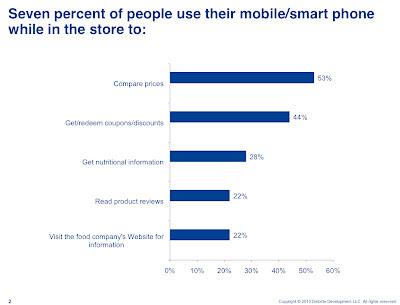 Assuming the rate of usage for food shopping stays flat, that would translate into 16-20% of food shoppers using their smartphones to learn about food products in the store. To be sure, we don't know frequency of use or the actual impact on what was purchased. Price comparisons and coupon hunting are a big part of this dynamic. But this behavior is more than incidental and it's bound to increase. The quality of information available in-store will only get better. The folks at GoodGuide provide detailed information regarding the health, environmental, and social impacts of over 70,000 products in your home. Their clever iPhone app is no doubt driving some of the in-store usage unearthed by Deloitte. 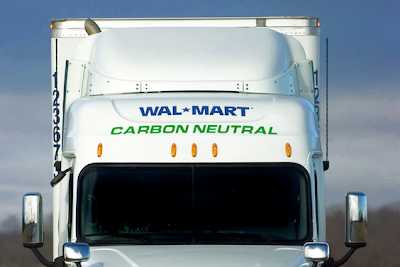 Walmart's sustainability index initiative will surely catalyze this transformation. And yes, I imagine someone at Facebook has mocked-up a "Liked" product rating index calibrated to the tastes and preferences of your very own social network. Your old high school girlfriend may finally add some value by helping you pick the right can of baked beans. Seriously, every aspect of a product - good and bad - will soon be transparent. How will marketers respond when their product is naked on the shelf? In this environment, Job One for marketing will be to make the product and usage experience extraordinary. Domino's recent moves to improve their product show that this strategy can drive significant increases in sales (see It worked! below). Smart shopping at the shelf will also impact other elements of the marketing mix. Traditional product demonstration and affinity advertising strategies will likely have a hard time competing with hard data in the store. How many FSI drops or TV target rating points will it take to top the impact of significantly superior quality or sustainability score - not to mention a timely digital coupon? If trends continue it may well become less expensive to differentiate and gain market share by improving product quality or how that product is made, shipped or recycled. A bigger question is how many TV TRPs will it take to counter a negative product performance issue? It's going to get interesting. Fast. Congratulations to the Domino's team for delivering a jaw-dropping 14.3% same store sales gain in Q1. Advertising Age today reported the big news. Back in early January, I wrote about Domino's gutsy decision to reformulate the product in my post, Marketing with a capital "M." The Pizza turnaround worked. Make the product better and apparently more people will buy it. Ad spending was up 9% for the period but that alone would not account for the increase (Papa John's sales were flat for the same period). Social media played a role here. 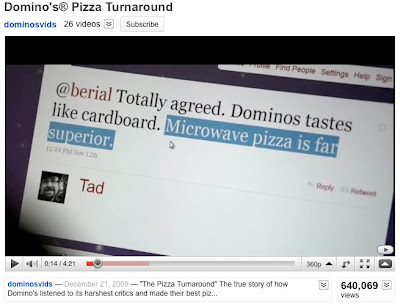 When I wrote in January, 170,000 people had seen the four-and-a-half minute Domino's YouTube video. As of today, the number is up to 640,000. That kind of momentum can only be sustained with sincere consumer interest and active social sharing. Domino's made real news by being honest about their situation. This campaign was not spin and people responded. This is a potent reminder that real marketing is more than ads and promotion. Product (and the product usage experience) comes first in a transparent, socially connected marketplace. Way to go Domino's! Corporate Responsibility Magazine shines a light on the Russell 1,000's least transparent companies. 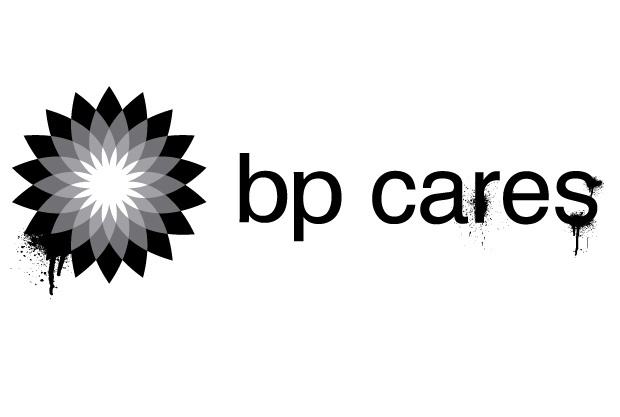 The Black List details 30 companies for whom zero points of relevant data can be found to compare their transparency to that of colleagues on the Russell 1000 list of large-cap firms. These companies are saying nada about things like climate change performance or broader environmental performance. The issue is bigger than the 30 companies on the list. 161 companies did not even have basic disclosure about their employee benefit programs. The magazine approaches this situation from a corporate governance/investor relations perspective. 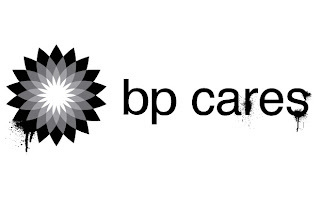 Their audience is the corporate executive charged with maintaining good "corporate responsibility." In the past, avoiding disclosure may have been a smart way to dodge controversy, oversight or unwelcome attention. Now choosing to not be transparent has its own cost. Remember that the next time you venture into an Abercrombie & Fitch store. Yelp just announced two substantial moves to eliminate the controversy brewing around alleged linkage between retailer advertising support and review quality. The company is making it possible to see how their review filter works and will even show you the reviews that have been filtered. They are also eliminating the "Favorite Review" feature. Why you see what you see on Yelp just got a lot more transparent. In retrospect, these changes are actually product improvements. Better information and less fog obscuring motives. For a company built on the idea of using consumer feedback as a weapon to reward and punish marketers, it's ironic they took this long to act on the input they were receiving themselves. Our natural reaction as passionate, competitive marketers is often to try and argue with the public when we feel they misunderstand our company or actions. That knee-jerk reaction immediately puts us in an adversarial role with consumers. It's hard to pull out of the ping-pong match once things escalate. At some point perhaps Yelp realized the angry hoards might have a point - maybe they could actually improve their product by making it more transparent. On the other hand, Yelp may view these recent steps as necessary concessions - conceding they could never argue the social media beast into submission. Either way, they made the right decision. Chalk one up for the meritocracy. I want to share an amusing peek at the future of traditional advertising agencies. The joke has been told before but this rendition nails a real truth - fewer and fewer consumers are influenced by blunt force attempts at persuasion. If not avoided or ignored altogether, traditional advertising rarely delivers the influence conveyed when one's peers weigh-in on the merits of a product or company via social media or in person. Many agencies ironically miss the point and assume they simply need to migrate to newer, digital communication channels. The transformation underway is not analogous to adding a department as agencies did during the mid-century transition from radio to TV. To be sure, "ads" will still be around to do things like rally enthusiasts and announce new products. But agencies will be distinguished by the ideas they bring that materially improve the customer experience or enable brand evangelists to share their convictions. We're coming full-circle back to an era where people rely on word-of-mouth and reputation to make purchase decisions. Technology will make it easier and better than ever but I think marketing in 2020 may work a lot more like marketing in 1820 than the way it does today. That's good for (good) brands and good for consumers. I predict a buyer's market for slightly used Foosball tables. Who will be the Southwest Airlines of car rental? I saw yet another article today on ways brands extract revenue from customers with occasionally clever but more often blunt force add-on fees and charges. Elizabeth Olson of The New York Times illustrates the recent escalation occurring in one particularly brutal category in her story, The rental car squeeze. Being charged $13 a gallon to refill the tank after dropping off your car (yes, this happened in Maryland) may generate a ton of cash in the short term but it can't help your brand. Not surprisingly, the percentage of dissatisfied travelers has nearly doubled from 12% to 21% in the last six years according to J. D. Power and Associates' annual Car Rental Experiences survey. This is not big news to anyone who has rented a car in the last six years. What is newsworthy is the inability of any brand to leverage the brewing customer revulsion. Twenty one percent of the market represents a ripe opportunity. A tactic like Guaranteed, out the door pricing at the time of booking would be a game changer. It could also help reverse an increasingly adversarial relationship with at least one car rental brand. Does this sound risky? Fortunately, a very similar approach has succeeded wildly just one floor up from the rental counters. Southwest Airlines is arguably the sole differentiated brand in the airline category. They have customer loyalty scores that are off the chart. So is their valuation when compared to the competition. 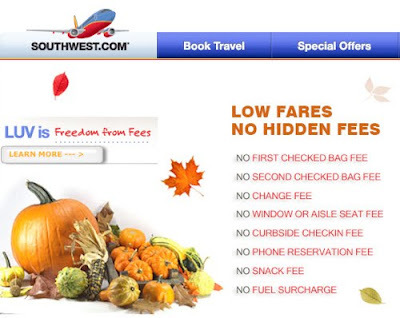 Part of the Southwest appeal is their determination to not stick it to customers with add-on fees or similar "gotcha tactics." It's time for a rental car executive to take the escalator up to ticketing to see how a successful travel category marketer delivers superior value for shareholders by making customer satisfaction (not short-term revenue enhancement) job #1. Fast Company today details 11 Ways That Walmart Is Changing Retail -- for Good with respect to sustainable business practices. These are the same 11 ways Walmart is differentiating itself from most other big box retailers by demonstrating extraordinary social integrity. Not surprisingly, these are also the 11 ways they will probably save significant money over the long run. Perhaps a better title for this article might be "11 ways Walmart won't have to compete on price." It's a fun slide show worth a few minutes of your time. Last post on Walmart for a while. I promise. Attention shoppers: Zero landfill corn chips are now available in aisle nine. 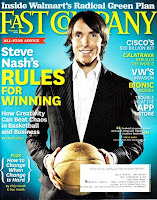 Great article by Kate Rockwood in the new Fast Company on Walmart's Sustainability Index. What caught my eye was a quote from the Walmart SVP of Sustainability, Matt Kistler. He said of this initiative, "it is creating a new level of competition in ways that, historically manufacturers have not competed." Kistler went on to confirm that high-scoring products will earn preferential treatment -- and likely more shelf space -- in Walmart stores. There. It's official. In addition to how well your product does what its supposed to do and how much it costs, there will soon be a third horse in the marketing race - the impact of the product (and company that makes it) on our planet and society. Shoppers won't be at the mercy of "greened-up" packaging or vague sustainability claims thanks to this quantified and verified index. Will a killer carbon footprint rating trump a super Sunday supplement coupon offer? We'll have to wait a little longer to find out but thanks to Walmart's clout, it looks like this is really going to happen. Is Blue Shield of California about to step on a land mine? 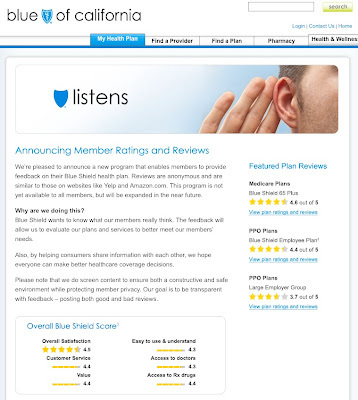 Advertising Age today covered Blue Shield of California's announcement that they would provide a forum on its website for customers to share ratings and reviews of its various plans. The program is just emerging from a pilot phase so there are not yet a ton of reviews. People will be able to find this information elsewhere anyway (Consumer Reports for one offers in-depth reviews of individual insurance plans with extensive reader reviews). Why not get points for making it easy to find and acknowledging that's how the world works now? It also makes it easier to stay on top of the conversation. Positive customer feedback in the context of an open forum (alongside negative comments) is the most credible endorsement you can get. Take away the negative comments and you have a very expensive brochure. Customer feedback might help prospects do a better job of choosing the right plan for their needs. Lower selling costs. Higher customer satisfaction. Win-win. Blue Shield of California might actually learn about what satisfies and dissatisfies customers. Isolate the hot buttons that drive purchases. Identify the things that cause you to lose customers. Beats mall intercepts. If Blue Shield of California substantially addresses the issues they learn about in this forum they have the potential to create brand evangelists. The most persuasive endorsers are often those who've been wronged who go on to have their problem resolved. It happens so rarely in the context of large corporate service providers that the occurrence is generally noteworthy. These turnaround experiences are genuinely tweet-worthy (as is ignoring a negative situation). Clearly this bold step is not without risk. If Blue Shield of California is to do more than ride the popular trend of being transparent they need to act on what they learn in this forum or it does have the potential to backfire. So imagine you run marketing in a company that sells 400 million units of anything a year. You're one of the largest players in what most people consider a promotion-driven, commodity category. You must be doing something right. Right? So naturally you go to your boss with the idea to radically reformulate almost every aspect of the product. That's apparently what happened at Domino's where they just introduced their "Pizza Turnaround." New crust. New sauce. New cheese. On virtually all their pizzas. The only thing they did not change appears to be the round shape. See the details (as have 170,000 or so other people) in the video below. Why gamble with a product that's so ubiquitous and successful? For one, I'm sure there's a lot of pressure on that poor little original recipe over time. Decades of procurement and operational "refinement" as well as vapid focus group input can really have only one effect - to identify the lowest cost item acceptable to the most people. Instant gratification through speedy delivery originally distinguished Domino's. Aggressive promotional marketing drove things further. Product quality was never a big issue for most of the brand's history. Competitors like Papa John's hammering for years about how their "real" and "fresh" ingredients are superior helped illuminate the issue. Old fashioned conversation amplified by newfangled social media makes product quality transparent. We've reached a point where Domino's is the least objectionable, instantly available but virtually unloved option in our personal pizza pantheons. Hat's-off to the Domino's team for having the stones to tackle the real issue. That's marketing with a capital M. Taking a step like this is rare in a world where brand and product managers often want to make their mark with a quick but modest win then move on in 12-to-18 months. They are honest and genuine. They admit to what we all know (they actually say "cardboard crust" out loud multiple times in the video) and get credibility points for doing so. Communications are straight forward and feature the head of the company and what appear to be real employees emoting honestly about their problem and their enthusiasm for doing something about it. They are giving "the people" credit for identifying the issue. A little pandering here for sure but Domino's seems a little less like a faceless corporation by actually appearing to listen. They went "all-in." Domino's did not decide to offer this as a new menu item or "premium" offering. It's appears to be on every regular Domino's pizza from now on. By going all-in, people sense sincerity and conviction. You don't bet the farm on spin and people know it. In a time where the quality of your product (and that of your competition) is transparent, marketing needs to think beyond promotion or even what we used to call "brand building." A move like this could yield exponential growth in category wallowing in incrementalism. We don't know if history will lump this effort in with Apple's overhaul of Macintosh with the eMac or the misadventure of New Coke. Maybe people actually like the lowest common denominator. That reminds me - the new season of American Idol starts January 12th.